Maurice Zolotow was early in identifying Ace In The Hole as a problem title for his 1977 Billy Wilder biography --- "Ace In The Hole" was castigated by the critics and shunned by the public. Wilder was called a cynical man. The film was denounced as an untruthful attack on the integrity of American newspapers and on the new medium of television. Subsequent writers picked up that ball and ran with it. 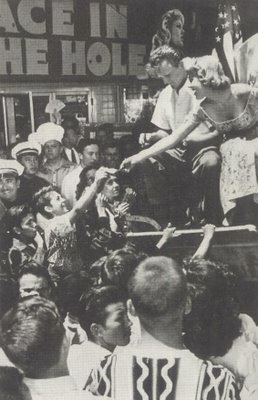 A disaster at the boxoffice, said Ed Sikov in his 1998 Wilder book, but in the early 1950’s, with faith in the nation’s ideological institutions assuming fanatical religious proportions, Wilder was offering a vision of Americans and their news media that few Americans themselves wished to confront, let alone applaud. Indeed, the director himself was eventually persuaded. They never gave it a chance, Wilder said. I only hope Billy wasn’t referring to Paramount, because the evidence indicates they gave it every chance, with a campaign as aggressive as any mounted during 1951. 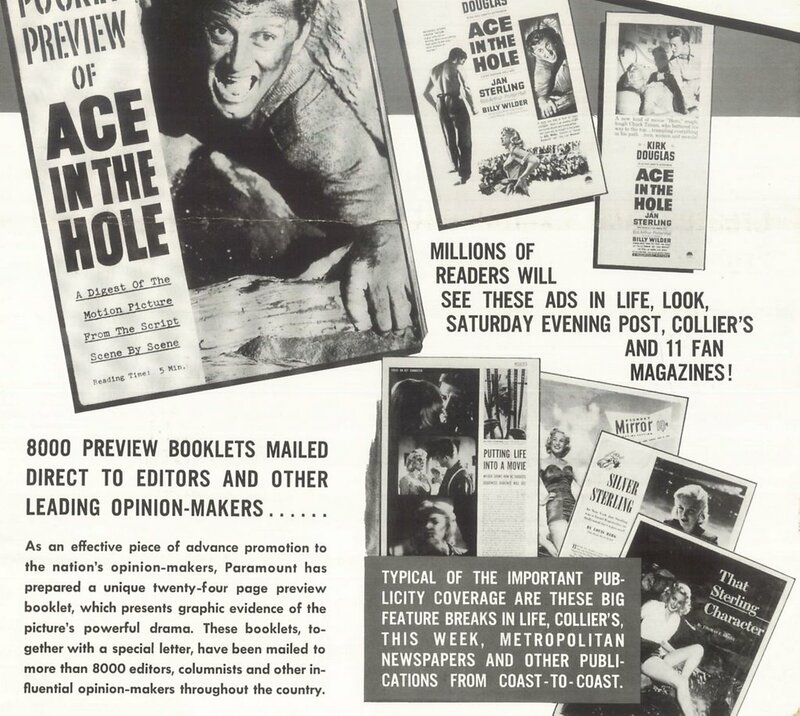 As to its boxoffice disaster, Ace In The Hole no doubt took a loss, but no more so than a lot of other features the company was distributing that year. With $1.2 million in domestic rentals, it equaled The Last Outpost and Submarine Command, while outperforming Hal Wallis’ production of Peking Express ($936,000) and a comedy sequel thought to be promising, Dear Brat ($890,000). The thing that was killing Paramount and the other majors was television. 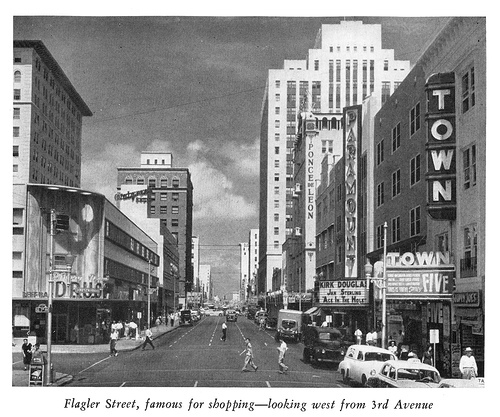 By mid-1951, there was a set in millions more homes than even one year before, and Hollywood movies were beginning to surface there. Republic had announced imminent sales of its backlog, and hundreds of independent features were dumped on airwaves by the week. You had to have something really special to entice people away from all that free entertainment. Paramount kept a man in the field by the name of Rufus Blair (above reviewing publicity material with an exhibitor contact). He’d been with newspapers and was a crack merchandiser. You might classify him as a Chuck Tatum with ethics. Rufus spent April and May canvassing thirty-four cities on behalf of Ace In The Hole. He had an open door with publishers, having worked with a number of them, and his mission was to target media folk --- be it editors, reviewers, radio personalities, whatever. Armed with a print of the feature, Blair knew it would click with former newshound colleagues. Trade critics were already flipping over Wilder’s trenchant drama, and Paramount was brandishing those raves among the trades at least two months prior to release. 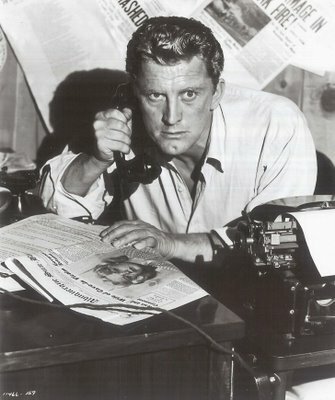 They played it up as a tough show in the tradition of The Public Enemy and Kirk Douglas’ previous Champion. News dailies swarmed over it. Here was a journalist rugged and ruthless like Cagney, Bogart, and Ladd. He grabbed a story by the throat and took no guff from bosses or women-folk. Rufus Blair knew reporters would embrace Chuck Tatum and they sure enough did. The character made them feel movie star cool. Further promotion in advance of the playdate found Jan Sterling getting a New York build-up on behalf of Ace In the Hole. Paramount tied in with Royal Desserts for recorded ads with Sterling, all of which concluded with a pitch for the feature, while millions of pudding packs and gelatin boxes went out with her picture emblazoned thereon. 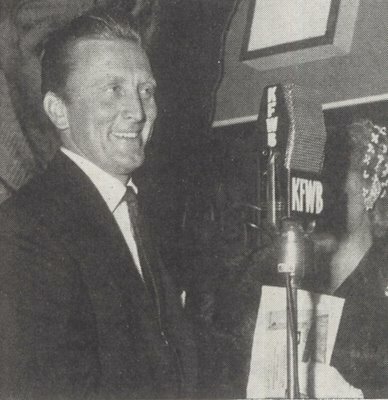 The Hallicrafters Corporation, then one of the big three radio/television manufacturers, continued their mutual sales push with Paramount that had begun with The Mating Season earlier that year. 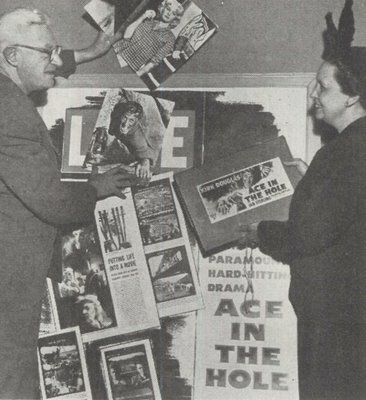 Field men for both companies linked up with local dealers, and Hellicrafter’s equipment was featured onscreen during Ace In The Hole. The Albuquerque location premiere followed in mid-June with a simultaneous opening in three theatres, attended by Kirk Douglas and Jan Sterling, who passed out autographs from their vantage point on a chuck wagon (shown here). New York’s opening at the Globe Theatre on June 29 was for the benefit of the Newsdealer Associations welfare fund, and Billy Wilder was in town for TV appearances and con-fabs with home office ad-press-publicity staff. Eleventh hour title changes were not uncommon prior to release. Such an action post-release was almost unheard of. An embarrassment for marketing, publicity, and distribution, it suggested a botched campaign. Isn’t there somebody in the studio organization who can yell murder when an unshowmanship title comes through the ordinary routine of production?, asked The Motion Picture Herald, after two Metro 1951 offerings sputtered on release. Wouldn’t it be possible to learn these facts a little earlier? Two Weeks With Love and Inside Straight represented good product badly sold. The Herald felt both could have benefited from exhibitor input on the front end. "Inside Straight" fell flat on its title during Easter week on Broadway because people assumed it dealt with card playing, whereas this was actually a period show about the California gold rush. 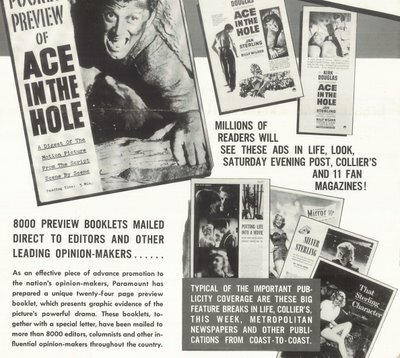 Ace In The Hole was also adjudged misleading. Was it too about gambling? If so, women weren’t interested. Many patrons had no idea as to the meaning of the phrase. Would they wait until after paying an admission to find out? Circuit heads thought not, and these were the men charged with getting pedestrians off the street and into their theatres. By mid-August, it was obvious Paramount had a problem. 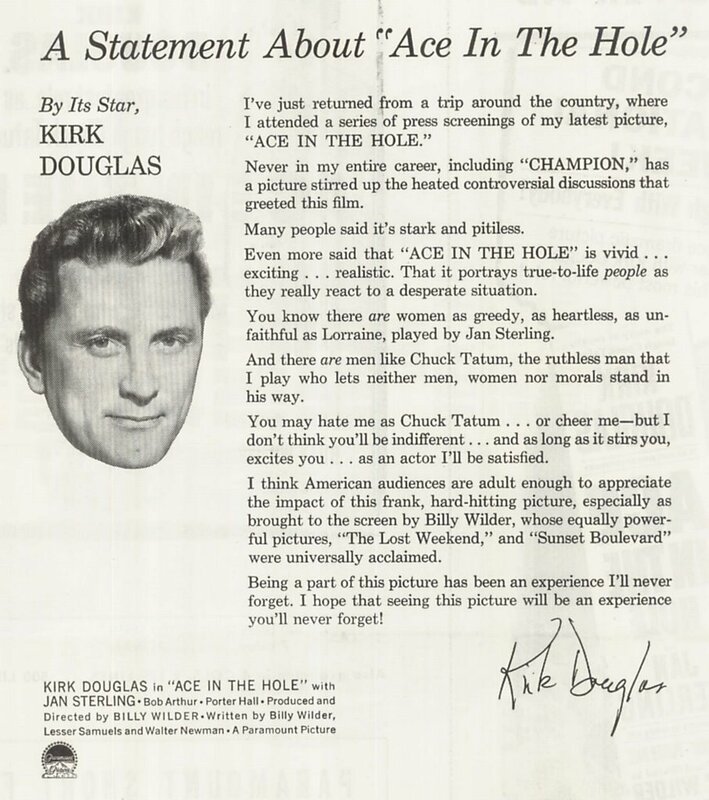 A picture with Kirk Douglas in the lead and reviews as positive as Ace In The Hole garnered should not be playing to empty houses. Obviously, they needed a new title. Showman (as well as editor-publisher of Motion Picture Exhibitor) Jay Emanuel spoke to the controversy in a letter shown in this trade ad. Latter-day cultists would consign Emanuel to the role of philistine, but I suspect he knew exactly what he was doing --- I personally supervised the campaign in each city to make certain it was proper and adequate. I also checked the comments of our patrons. The results can be summed up briefly. The people who came to see the picture enjoyed it immensely but the picture did not roll up the gross to which I felt it was entitled. This was the sort of grassroots movement on the part of exhibitors from which a newly re-christened The Big Carnival emerged. Prints already in exchanges had to be physically amended with new title footage. 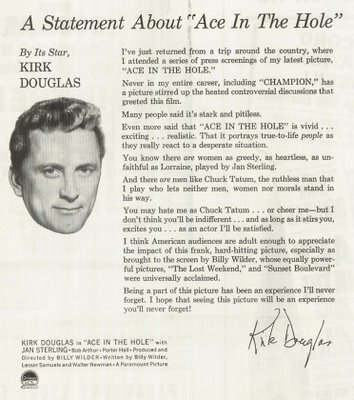 No doubt a few Ace In The Hole stragglers continued playing under its original name through 1951, much like that last rattlesnake Chuck Tatum described as having gotten away in the feature. 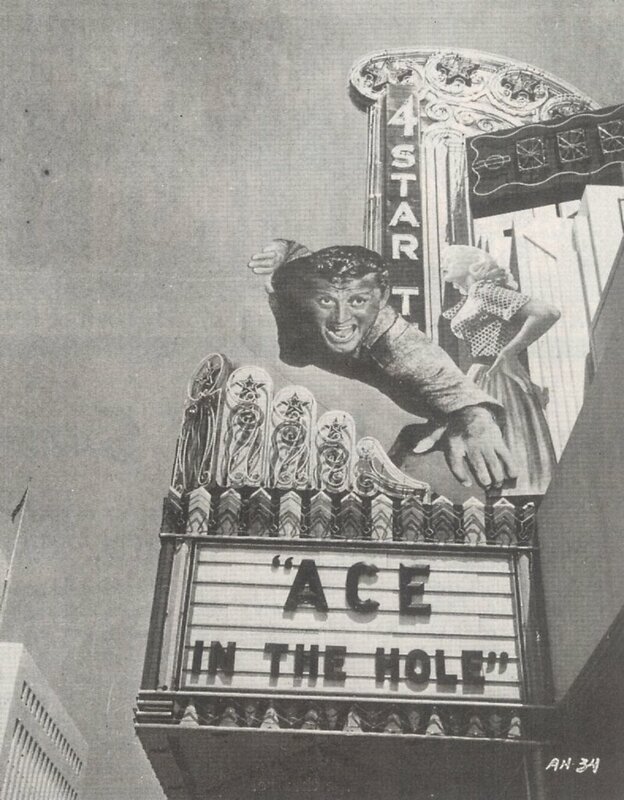 Billy Wilder spoke to the topic years later --- Behind my back, because I was making a picture in Paris at the time, Mr. Freeman, head of the studio, changed the title from "Ace In The Hole" to "The Big Carnival" --- like this is going to attract people. Without asking me! It was one of the reasons I left Paramount. All well and good for a director wanting to distance himself from an event well after the fact, but Freeman wasn't the one to call this shot. New York would have made that decision. I’m betting too that Wilder was consulted, and ultimately bowed to sales department wishes. These weren’t the idiots and troglodytes he liked to portray before adoring interviewers taking his anecdotes at face value. They were capable merchandisers who knew how to campaign on behalf of their product. Wilder just handed them sour fruit this time, and neither exhibitors nor customers were sure how to digest it. So what happened to The Big Carnival when it got into the general release market? It played at least a month as Ace In The Hole before the switch. Business needed a goose, thus the new moniker. For my money, the title would not change boxoffice, was the report from Hollister, California’s State Theatre. The picture is different, but drawing power, in spite of exploitation, is limited --- the second and third day died. Could this have been the result of bad word-of-mouth among locals? The Booth Theatre’s manager in Rich Hill, Missouri spoke to that --- Our patrons thought it a little heavy. Got a bunch of kids who did not know what the show was about. No, it sure wasn’t for kids, but really, was it for anyone? OK picture, but did poor business, was the curt appraisal from the Jackson Theatre in Flomation, Alabama. Well, you couldn’t bring them into the theatre at gunpoint after all, and Wilder’s line in nihilism really wouldn’t come into fashion for at least another twenty years. Paramount couldn’t be bothered with a re-issue, and the death march to television opened with a berth on NBC’s December 4, 1965 broadcast of Saturday Night At The Movies. 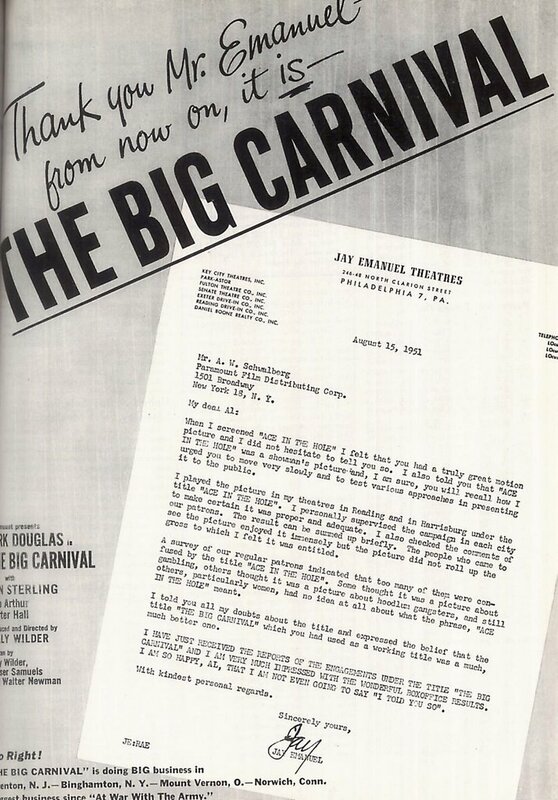 From there, The Big Carnival was shuffled off to syndication as part of the company’s Portfolio One package, where it would share late show dates with The Man Who Shot Liberty Valance, I Married A Monster From Outer Space, My Favorite Spy --- some fifty Paramount titles that became available to local TV markets in April, 1967. You could rent it through Films, Inc. during the seventies on a sliding scale. Titles in their catalog were ranked by stars --- anywhere from one, two, three, to "special." ---based on perceived merit. The Big Carnival got a one, which means you could have it for anywhere from $15 a day for schools and convents (!) with less than 100 in your audience (probably a cinch with this one) to a maximum $100 for colleges and film societies with over 1251 heads in the room. Paramount passed on a VHS release, and have remained deaf to pleas for DVD availability. Bootlegs are occasionally intermingled on E-Bay with a 2005 docu-drama entitled Ace In The Hole, wherein it’s Saddam Hussein instead of the film’s Leo Minosa who’s buried. One enterprising VHS peddler offers attractive box art likely to fool the unwary, while the rest of us go on waiting for Paramount to pull the trigger with an authorized release. Let’s hope it won’t be too long (and indeed it wouldn't be, for a Criterion released DVD has appeared since the original date of this posting). A Small Postscript --- I came across a trade ad for Captain Video and decided to add it to the July, 2006 posting on that serial. This is something I hope to do from time to time as fresh images turn up on films I've previously covered, and I'll try to note them here. UPDATE (9-18-07): Just got some additional financial info for Ace In The Hole. The negative cost was $1.821,052.78 million. Thanks for such an informative post on one of my favorite Wilder pictures. You just never can tell what will sell or won't. But your evidence is persuasive that Paramount didn't dump it. In hindsight, just the simple fact of a name change is proof that the studio was trying to do something for the film. It'll be released for the home theatre ... eventually! Cinemax -- back in the day when it showed scores of interesting older films every month -- did indeed run CARNIVAL at least once in the late '80s or early '90s; I still have a taped copy from its airing. I didn't see the TCM broadcast -- did it sport an ACE title card? I've seen this in various venues over the years, but I'll never forget encountering it on a late, late show in the late '60s. I was in a sad, bitter mood, oddly open to its uncompromising darkness. The movie just burned itself into my soul. It isn't just cynical -- it's utterly pessimistic. There's nothing like it. Thank you for this piece! 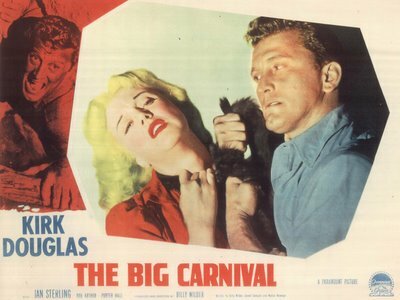 I saw this movie (as "Big Carnival") when NBC first aired it; I was just a kid, but I knew there was something different about it. Never forgot it, and videotaped it off of TNT in the '80s. About 10 years ago it ran on AMC (with the original "Ace in the Hole" credits! )one Friday night. My wife watched it with me. She shuddered throughout, and had nightmares the rest of the weekend. 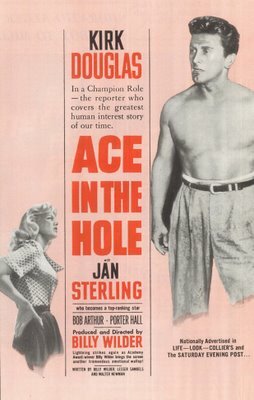 "Ace in the Hole" is my favorite Wilder movie. He must've been looking into a crystal ball when he wrote the script. News and entertainment have become irretrievably blurred -- he knew it was coming and warned us, but nobody wanted to listen. 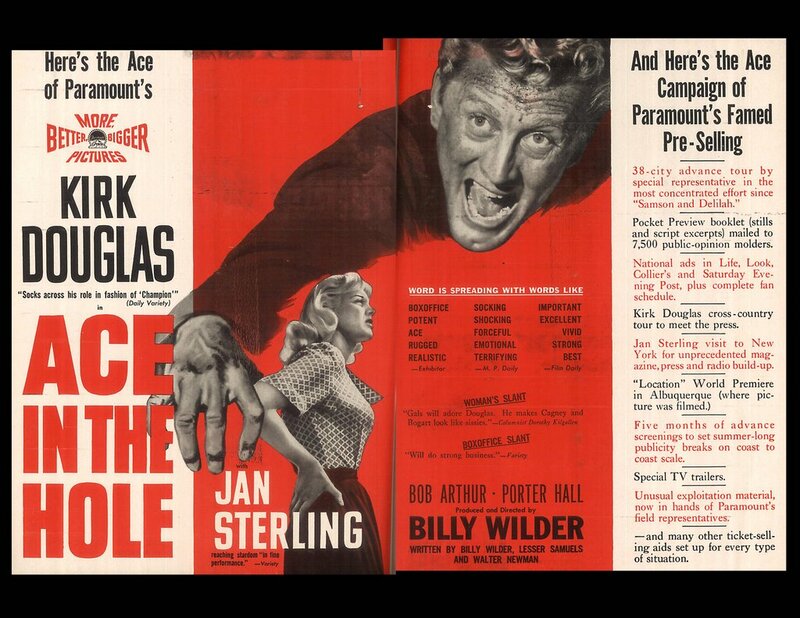 Griff-- yes, TCM ran it with an Ace in the Hole title card. Where have I been that I haven't discovered this amazing blog? (having a baby, for one thing, but never mind.) This place is fantastic, I absolutely love it. This piece is especially interesting to me because I just wrote up Ace in the Hole at my place and at NewCritics. Thanks for the corrective to the CW about Paramount dumping it; that notion was all over the materials posted at Film Forum, for one thing. I finally caught up with this film on TCM the other day. It IS a marvelously done film. It is also one of the "feel bad" films of that year and produced on the scale of a Cecil B. DeMille film. No wonder it didn't do too well. 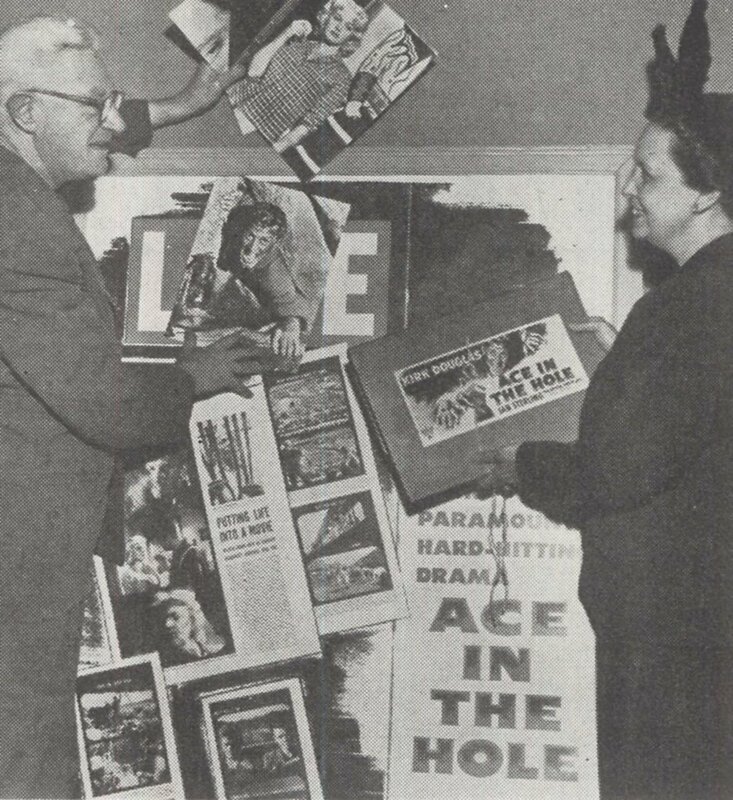 If I were a working stiff of that time looking for a bit of relaxation with my wife at the local Bijou ACE IN THE HOLE/THE BIG CARNIVAL wouldn't have been my choice. I'm not condemning the film but its lack of broad appeal is also understandable. I’m glad Wilder got to do it and I’m glad someone at Paramount decided to fund it but there really wasn’t the audience for it.